TANCET 2018: TANCET (Tamil Nadu Common Entrance Test) is the state level entrance examination, organized by Anna University. This exam is conducted for admission to the ME/M.Tech/M.Arch/M.Plan, MCA & MBA courses. Through this exam, candidates can get admission into the government & non-government colleges of Tamil Nadu state. 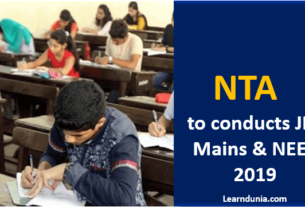 Candidates can get complete information regarding TANCET 2018 entrance exam, application form, eligibility, exam dates, syllabus, etc. TANCET 2018 Result has been declared on 8th June 2018 Click here to check. M.Tech/ME/M.Arch/M.Plan Qualifying Exam: Pass Bachelor’s degree or equivalent in any disciplines. MCA Qualifying Exam: Pass Bachelor’s degree of minimum 3 years with mathematics at 10+2 or graduation level. Candidates who have completed/ are in their final year of Graduation can apply. Candidates who have passed 10+2 or possess a 10+3 years diploma certificate from the State Board of Technical Education are eligible. Candidates who have a valid GATE score with qualifying marks in Engineering Science (XE) and Life Science (XL), they have to appear for exam also. Visit the official website of Anna University (annauniv.edu). Click on ‘TANCET 2018 Registration’. Enter your Name, Date of Birth, Email ID, and Password to generate id and password. Post submission of the form, an application number will be auto-generated by the system. Candidates have to fill only one application form for all the three entrance exams. There is no need to send the filled application form through offline mode or by post. TANCET Online application form will be available from the month of April 2018. If a candidate wants to appear for more than one programme, then they have to deposit Rs. 500 (Rs. 250 for SC/SCA/ST candidates belonging to Tamilnadu) for every additional programme. Tancet Exam Pattern: TANCET 2018 Application Form will be release in February 2018, and exam will be held on 4th week of March 2018 and the examination for MBA & MCA is organized on the same day. The duration of exam is two hours. there are 100 questions asked in the examinations. The question will be of multiple type questions. There is one marks be allotted to the candidates for correct answer. For incorrect answer, 1/3 marks will be deducted. application Form release in 2nd April 2018, and exam will be held on May 2018 and the examination for MBA & MCA is organized on the same day. The TANCET admit card will be available on the month 0f May 2018. Candidates are able to get their Admit Card through online mode. Candidates will check their results through online mode within the two or three weeks of the examination. It may be declared in the second week of April 2018. Looking for the syllabus with the best preparation strategy? When will release TANCET Application Form?